AP Panchayat Secretaries District Wise 1051 Posts Notification 2018 | Apply Now at www.psc.ap.gov.in : AP Panchayat Secretaries 1051 Posts Notification District Wise Vacancies download. APPSC Group III Recruitment 2018 Notification Out- 1670 Panchayat Secretary & Junior Assistant Jobs Online Apply Process. APPSC Group 3 Notification 2018 Apply Online For 1051 Panchayat Secretary & Junior Assistant Posts, APPSC Group 3 Notification 2018 – Apply Online For 1051 Panchayat Secretary/Junior Assistant Posts. APPSC Group 3 Notification 2018 | Apply Online For 1051 Panchayat Secretary Grade IV Vacancy @ www.psc.ap.gov.in. AP Panchayat Secretaries District Wise Vacancies Vizianagaram Visakhapatnam East Godavari West Godavari Krishna Guntur Parkasam Nellore Chittoor Anantapur Kurnool Kadapa. AP Panchayat Secretaries 1051 Posts Notification, Andhra Pradesh Panchayat Secretaries posts to be filled as per GO MS NO 153. AP Panchayat Secretaries Recruitment 2018 District Wise Posts in AP. 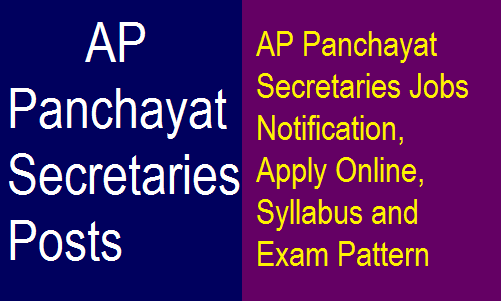 Andhra Pradesh Panchayat Secretaries Jobs Apply Online, Syllabus, Exam Pattern at psc.ap.gov.in.